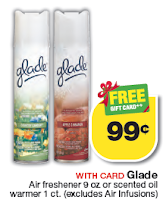 2 FREE Glade Products w/ Coupon! Starting 11/27, you can score a great deal on Glade products at CVS! Don't forget, you can print 2 coupons per computer!